This handy checklist can help get you on the right track! Keeping up with OSHA’s HazCom Standard (HazCom or HCS) can be a full-time job these days. With the GHS phase-in period over and OSHA's increased focus on enforcement, employers should waste no time getting their HazCom Programs in order. 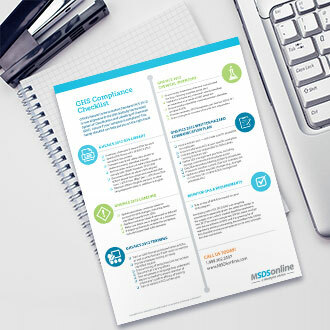 Download our GHS / HCS Compliance Checklist to make sure you're meeting all your obligations now that GHS is in full effect. Use this handy checklist to help get and stay compliant with OSHA's HazCom Standard and GHS modifications.